Last night Paul Grevink posted a nice post about the basic setup for Check MK and i am really looking forward to the rest of the series. At my current customer we are also using Check MK so i decided to use the script I made for the VMware Login monitor fling to give output usable for Check MK. At first I was messing with the plugin folder in the check mk folder on the windows server hosting the txt files but a colleague pointed me at the local folder. The big difference is that with the local folder Check MK directly uses the output and the plugin monitor it needs another python file on the check mk server to use the data. # $warning for the warning value above wich Check MK will give a Warning. # $critical Gues what, this is the value above wich Check MK will give a critical report. write-output "0 VMware_Horizon_View_Logon_Time LogonTime=$average|Logons=$count Logon time : $average sec for $count logons in the last $fileage minutes." write-output "1 VMware_Horizon_View_Logon_Time LogonTime=$average|Logons=$count Logon time : $average sec for $count logons in the last $fileage minutes." 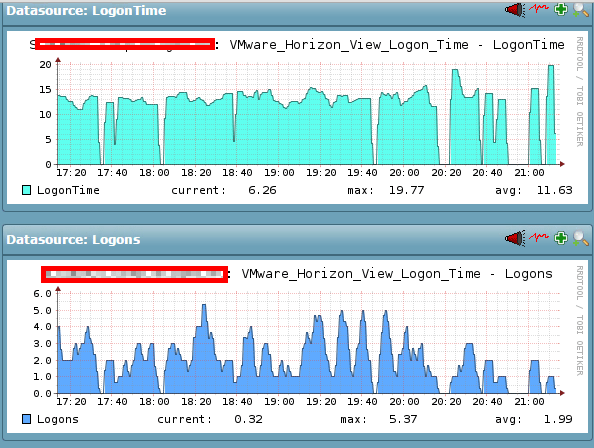 write-output "2 VMware_Horizon_View_Logon_Time LogonTime=$average|Logons=$count Logon time : $average sec for $count logons in the last $fileage minutes." "2 VMware_Horizon_View_Logon_Time LogonTime=$average|Logons=$count Logon time : $average sec for $count logons in the last $fileage minutes." The first digit is the status, 0 for ok 1 for warning and 2 for critical. then separated by a space (and after this you can use spaces) the text that wil show in Check MK. « Installed the VMware Logon monitor, now what? Let’s make a script!